Huawei earlier this month announced the Honor 6 Plus, one of the company’s most advanced smartphones to date. Initially released in China, the Honor 6 Plus is now also available to customers from almost all over the world. 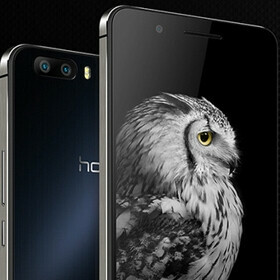 Retailer Oppo Mart is selling the 16 GB version of Huawei’s Honor 6 Plus for $399 (unlocked), though it’s currently offering only the white model. One of the highlights of the Honor 6 Plus is its dual camera system that’s found on the back, consisting of two 8 MP sensors: one with f/2.0 aperture and autofocus, and another one with f/2.4 aperture and a fixed focus. Huawei calls this “symmetrical dual camera technology”, mentioning ultra-fast focus times, and variable aperture among its benefits. You can find out more about this dual camera here. Sporting a 5.5-inch 1080p display, the Honor 6 Plus also features LTE connectivity, an octa-core 1.8 GHz HiSilicon Kirin 925 processor, 3 GB of RAM, microSD card support (up to 128 GB), and a 3600 mAh battery. At the moment, the handset runs Android 4.4 KitKat customized with Huawei’s EMUI 3.0 UI. What do you think, is Huawei's latest smartphone worth $400? Battery technology hasn't been advancing much compares to other techs. Fast charge decreases battery life faster. Unless my phone has removable battery, I'd like to charge it normally. qualcom Quick Charge is NOT a brute force high speed charging. It's a smart charging that charge with high speed when the battery is empty, and use less and less speed as the battery getting full. really? do you have link? but what about the charging tech used by that phone? Apple Pony? Whats that me... ohhhhh, never mind. You might be right, but most often a cheap user is a smart shopper. LOL. This just shows how you're bad with money. I have no idea how much you make a year, maybe a lot. But you're definitely not a smart shopper. You might as well be proud of whatever you are, even if it is being stupid. so a over priced phone = for expensive user ? The only let down for me is the processor. I really hope that most of flagship in 2015 will have Quick Charge 2.0 (or equivalent), and this kirin CPU certainly won't have it. Dont know what your criteria for quick charge is , but its 5inch predecessor, the Honor 6 with 3100mAh charges 0 to 100% in 2 hours while upto 90% in 1 hour. I'm talking about qualcom Quick Charge 2.0https://www.youtube.com/watch?v=kB0cyTcL-6U If what you said it's true... 90% in 1 hour, that's impressive. 'heavy usage' is subjective. It's need controllable measurement such as the one done by PA. and are you sure they use fast charging. because if that's true, they will brag about it. To Phone Arena. Please TEST all the phone with 2.0 capability with 2.0 charger please. This phone will hurt Samsung more than iPhone. The only thing I don't like about huawei phones is that they don't use Qualcomm's chips. The Huawei Ascend Mate 2 4G uses a Snapdragon 400. With the bands listed on Oppomart, I don't think it would even work with 3G here in USA!! $350 would've been a sweet spot. will the LTE work on AT&T's network? If not, no sale at any price. They better sell them quick before Apple hits them with an import ban. I see it coming now.